For years, the funeral industry operated with little regard for consumer rights, pushing and selling services to their customers that were costly and unnecessary and keeping prices hidden until it came time to pay the bill. But as of 1984, funeral homes are required to follow regulations outlined in the Federal Trade Commission’s Funeral Rule, which was written to bring more transparency to the industry. However, funeral scams still exist. Here are eight you should be aware of. 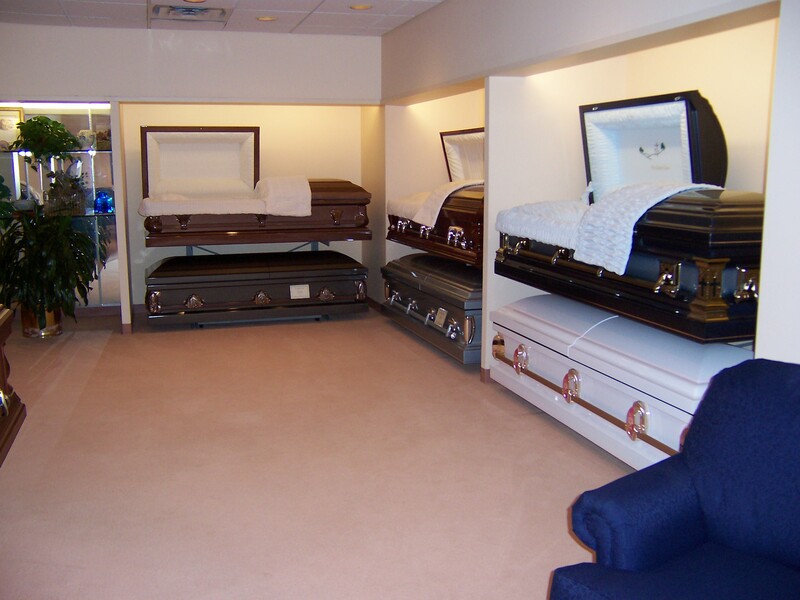 A funeral home’s “casket room” is like a car dealership’s showroom. Once you get over the shock of walking into a room filled with caskets, you’ll have to brace yourself for the prices of these shiny, beautifully finished models. The Federal Trade Commission requires funeral homes to provide consumers with a list of all of the caskets they have available, including descriptions and prices. Realize that less expensive caskets may be hidden away, or painted in unattractive colors to discourage a purchase. You can even buy cheaper caskets online from Walmart and Costco. When it comes to funeral scams, so-called “protective” caskets deserve a special mention. Funeral homes may try to sell you a casket that will supposedly protect and preserve the body of your loved one thanks to a rubber gasket designed to prevent water from entering the casket. Take note: this is a total crock. Gaskets do nothing to preserve a dead body, and in fact, since they trap oxygen and gas inside, they can cause a casket to explode once it has been buried. Funeral homes typically charge $700 or more for “protective” caskets, and may even remove and reuse rubber gaskets without your knowledge. For a long time, funeral homes were not required to share and explain their pricing, leaving consumers in the dark as to what they were actually purchasing and ultimately spending. The aforementioned Funeral Rule mandates that funeral homes break down (i.e. itemize) their prices, and allow their customers to purchase only what they want. Funeral homes can and will offer you package deals, but they must offer their products and services individually as well. Some funeral homes may tell you your state requires that they embalm the body of your loved one, and of course that’s going to cost you more money. But embalming is not mandatory, except in situations where the body is being transported by air to another funeral home or when the service includes an open casket viewing of the deceased. So remember, Federal Trade Commission regulations state that funeral homes may not embalm for a fee unless, given those circumstances, it is required by law, or expressly approved by the customer. This is a service that seems like a good idea, but in practice is usually a way to rip off a customer. A prepaid contract with a funeral home is supposed to guarantee a set of goods and services upon the death of the customer. But once the customer in question is dead, funeral homes may only provide some of the services, claiming they need to be compensated for inflation, or steal the prepaid funds, disappear, and leave your loved ones stuck with having to pay for your funeral. Consider instead opening up a “payable on death” account with your bank, which will generate interest and can be used for the costs of your funeral when you pass. While funeral homes may stop short of asking you if you want fries with your casket, they may try to convince you to add on products and services you simply don’t need. Customers who buy into the above mentioned prepaid plans may receive sales calls from “grief counselors” who will push them to upgrade the plans they’ve already paid for. Be aware too that you may be pushed into buying a good or service that is provided in a package you’ve already purchased. Direct cremation can save you hundreds of dollars in funeral costs, but be aware that there are options when it comes to cremation. You are not legally required to purchase a casket with a cremation. But if necessary, you can purchase an unfinished box for use prior to cremation. Funeral homes should not charge you for embalming, since there is no public viewing with direct cremation. Also, you aren’t required to purchase a specially constructed, expensive urn to contain the remains. Crematories can instead place your loved one’s remains in metal, plastic, or a cardboard container. Ask the crematory to explain their process, and how they will track the body of your loved one. This may sound horrible, but you want to be sure that after cremation, they give you the right person’s ashes! The term “grief counselors” is a real misnomer when it comes to describing a person who takes advantage of another person’s fragile emotional state in order to make money. When dealing with a funeral home, partner up with another family member, your spouse, or a close friend, and bring them with you to any face-to-face meetings. Having a trusted person next to you can help you remain objective and make decisions that are practical, smart financially, and not based on a salesperson trying to guilt-trip you into upgrading to a $5,000 coffin.